Highly durable, our bags, pouches and keepers provide secure tool transportation, are easy to use and comfortable to wear. We can also design and manufacture to your requirements including custom branding such as company logo, rig name, etc. Durable, easy to clean, PVC coated polyester. Velcro secured flap with pull strap. 6 internal SS locking hooks to secure tools. Internal components pocket with velcro flap. 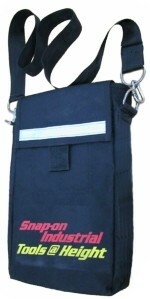 Chest strap with SS locking hooks. Open mouth for easy access. Draw-cord neck and reinforced base. 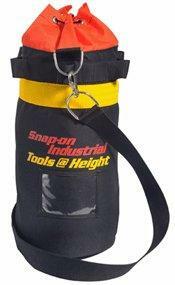 Internal SS locking hooks to secure tools/rope/lanyards. 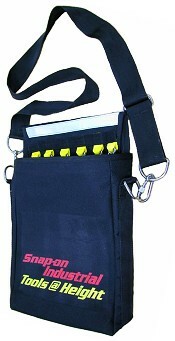 External loops for attaching tools. Loops for securing bag to belt. 2 x 60mm SS locking hooks with eyes - can rotate on "D" ring but cannot detach. Slot for belts up to 65mm wide.